Norfolk and Suffolk NHS Foundation Trust (NSFT) plumbs the depths of infamy as the tragic and avoidable death of Christopher Higgins features in the current issue of Private Eye. The magazine cannot be read for free on the Internet but you can support investigative journalism by spending £1.80 on Issue 1409 at your local newsagent. The inquest heard that Christopher’s was one of ten unexpected deaths of mental health patients from the West Norfolk area between April and December 2013. 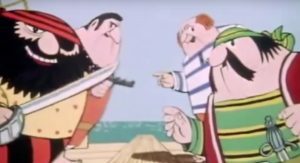 In each case, failings in assessment had occurred. 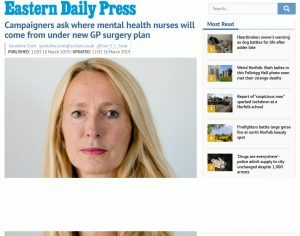 Sources within NSFT privately admit that the Norfolk Coroner, Jacqueline Lake, ‘let us off very lightly indeed’; that the standard of ‘care’ Christopher Higgins received was ‘appalling’. 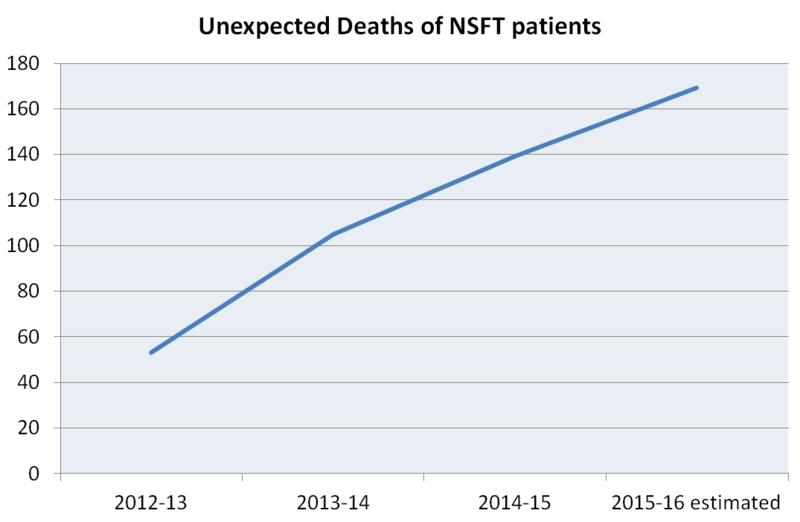 Yet, despite NSFT’s apology and claim of ‘major improvements’, the number of unexpected deaths of NSFT patients has continued to rise (see the graph below), with seventeen unexpected deaths in July 2015 alone. I knew Chris through work, this is utterly tragic. “Lessons will be learned,” eh? 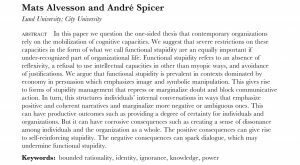 And “robust solutions put in place.” As usual. 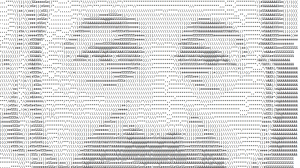 This man is any and all of us and what happened to him is vile. My daughter Louise also committed suicide in July 2010 aged 24 whilst in a secure unit at Northgate Hosptal in Great Yarmouth. 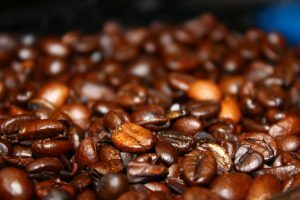 We also contacted Bindmans LLP to try and help us found out how this terrible tragedy could have happened. 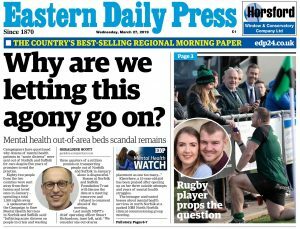 We felt after the inquest, where the Trust admitted that serious failings had led to Louise’s death there would be a massive shake up within the Trust as the Coroner made lots of recommendations to them for improvements of care. Sadly this does not seem to have happened. My thoughts are with Christopher’s family for their heartbreaking loss. “Christopher Higgins was loving son who had never been in trouble with the authorities. Until the onset of his illness, he had been employed for the previous nine years in a responsible job. He was a proud man who had recently gained the necessary qualifications planned to work as a personal fitness trainer. 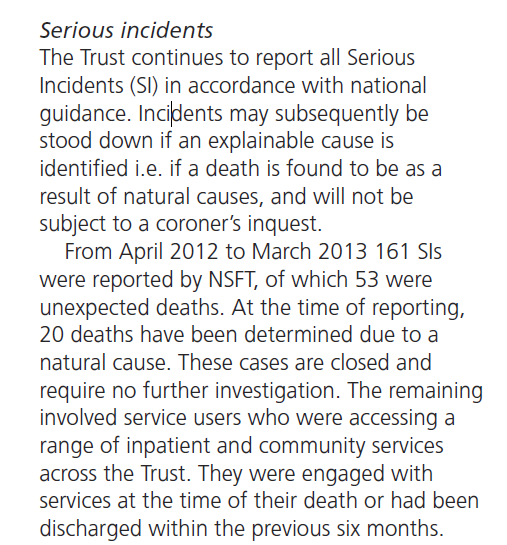 b) A meeting with the Coroner so that we can better understand why it appears that no Section 43 referral has been made. 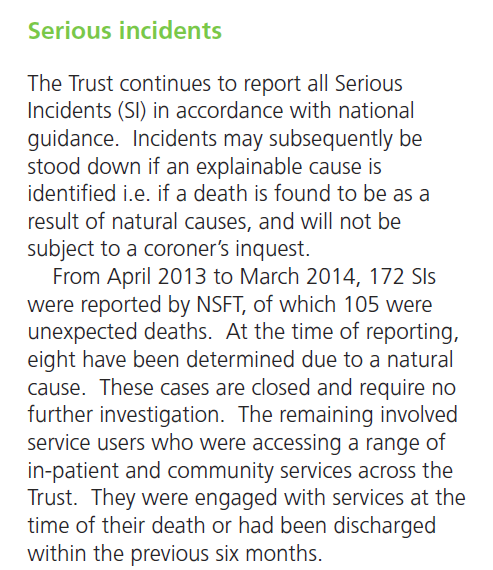 We are concerned that the dramatic reduction in resources, particularly the closure of assertive outreach and homelessness teams by NSFT, contrary to national guidance, other evidence provided to the court and our own campaign members’ experiences gives rise to a serious concern that there is a significant risk of future deaths, fully justifying the making of a report to NSFT. 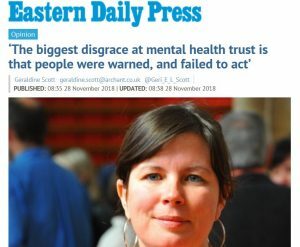 The Norfolk Coroner refused to provide the information or to meet our local mental health campaigners. 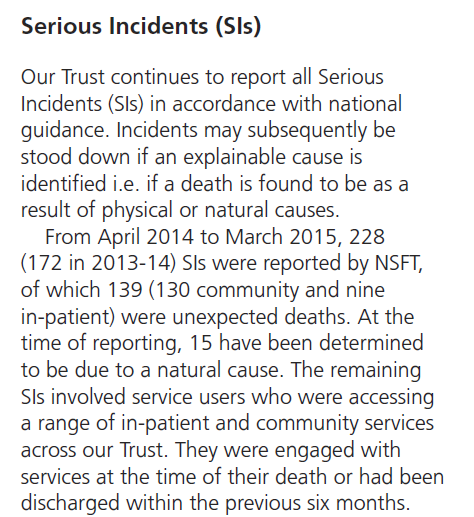 Perhaps the Norfolk Coroner should examine this graph of the unexpected deaths of NSFT patients and see if she can spot a trend?